(仙丈ヶ岳) or Mt. Kai-koma-ga-dake (甲斐駒ヶ岳)? Click here to ask or share it! The awesome peaks of Mt. Senjo-ga-take (仙丈ヶ岳), elev. 3033m, and Mt. Kai-koma-ga-dake (甲斐駒ヶ岳), elev. 2967m, in the northern section of the Southern Japan Alps (南アルプス) are two of the couplet mountains I mentioned on my Mt. Suisho-dake/Mt. Washiba-dake page that you can climb in tandem. Although unlike the other couplet peaks among Japan's highest mountains, the trailhead at Kitazawa-toge (北沢峠) is between the two peaks, so you have to hike all the way back down to the bottom before you can hike up to the top of the other one. But they're both pretty easy, so it doesn't really matter much. If you're only going to do these two main peaks as I did, rather than tackling other prominent peaks in the immediate area, such as Mt. Nokogiri-dake (鋸岳), Mt. 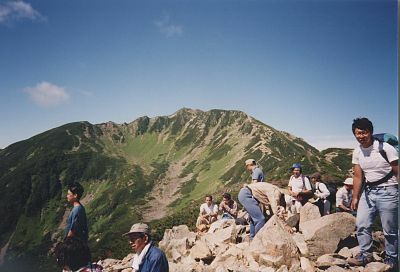 Kita-dake, or Mt. Ho-o-sanzan (鳳凰三山), I'm not sure whether there is any particular strategy on which of the two peaks you do first. In my case, I chose to climb Mt. Senjo-ga-take (仙丈ヶ岳) first, so I could stay overnight at the Sensui-goya (仙水小屋) mountain hut, which is about 45 min. along the Mt. Kai-koma-ga-dake (甲斐駒ヶ岳) trail from the Kitazawa-toge (北沢峠) trailhead. Another option that many hikers choose, is to stay at one of the mountain huts at or near the Kitazawa-toge (北沢峠) trailhead, including Choei-so (長衛荘), Kitazawa-koma-sen-goya (北沢駒仙小屋), or Ohira-sanso (小平山荘). This way you can park your heavy gear at the hut and climb both peaks with a light day pack. One of the things I like best about the Southern Japan Alps (南アルプス) is their proximity to Tokyo. Mt. Senjo-ga-take (仙丈ヶ岳) and Mt. Kai-koma-ga-dake (甲斐駒ヶ岳), the 18th & 24th highest mountains in Japan, were another set of peaks that I did in only two days. 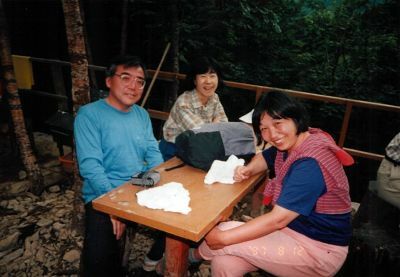 During my Obon holidays, I left Shinjuku just before midnight on Monday, August 11, 1997 and arrived back in Shinjuku around 6:30 pm two days later on August 13. After arriving at JR Kofu Station, I caught a 3:00 am bus for Hirogawara where after arriving there, I transferred a couple of hours later @ 6:50 am to a microbus which drove me 25 min. to the Kitazawa-toge (北沢峠) trailhead. After hitting the trail around 7:20 am, the approximate three-hour trek to the summit of Mt. Senjo-ga-take (仙丈ヶ岳) was very pleasant, where you first pass through a very dense forest before reaching a fork in the trail at Go-go-me (五合目, Fifth Stage), the theoretical halfway point. The right fork will take around 30 minutes longer to the Mt. Senjo-ga-take (仙丈ヶ岳) summit, but also has three mountain huts along the way, in case you would need to seek refuge or are looking for a place to stay. In ascending order, these mountain huts are Senjo-yabusawa-goya (仙丈薮沢小屋), Uma-no-se-hyutte (馬の背ヒュッテ, "Horseback Hut"), & Senjo-goya (仙丈小屋). In my case, I chose the left fork, both up and down. By the time you reach Mt. Ko-senjo-ga-take (小仙丈ヶ岳), you'll be above the tree line and will have some absolutely stunning views of other peaks in the vicinity, including not only nearby Mt. Kai-koma-ga-dake, but Mt. Nokogiri-dake (鋸岳), Mt. Kita-dake (北岳), Mt. Ai-no-dake (間ノ岳), Mt. Fuji (富士山), Ho-o-sanzan (鳳凰三山), and on a clear day, even the Central Japan Alps (中 央アルプス) & Northern Japan Alps (北 アルプス). There is also a 3rd trail to the Mt. Senjo-ga-take (仙丈ヶ岳) summit, starting from near the Ohira-sanso (小平山荘) mountain hut, which is known as the Yabusawa Route (薮沢ルート) and can be viewed in the map on this page. After hiking back down to the Kitazawa-toge (北沢峠) trailhead, I trekked 45 min. or so over to the Sensui-goya (仙水小屋) mountain hut, my sleeping spot for the end of Day 1, arriving there around 3 pm. This mountain hut was one of the more interesting parts of my trip, where I easily made many new friends, getting lots of special attention from being the only gaijin in the area. To be honest, this is one of the many reasons I enjoy living in Japan so much. Because here I am frequently made to feel special, almost on a daily basis, I in effect often feel like a big fish in a small pond, rather than just a small fish in a big pond…..which is the way I'm usually treated back in my home state of Texas. The Sensui-goya (仙水小屋) mountain hut was pretty small, sleeping only about 30, but I was impressed with their solar stove, and a couple of the guys staying there were artists. One fellow was a watercolor painter and another was a profile sketch artist, pics of both which are in my photo album below. Starting my hiking at 5:15 am, from the Sensui-goya (仙水小屋) mountain hut to the summit of Mt. Kai-koma-ga-dake, Japan's 24th highest peak, was not too difficult a trek, albeit a tad steep, passing Sensui-toge (仙水峠) & Mt. Komatsumine (駒津峰) along the way. Again, like Mt. Senjo-ga-take (仙丈ヶ岳), the views from the summit of Mt. Kai-koma-ga-dake (甲斐駒ヶ岳) were to die for. A mandatory slight detour near the summit of Mt. Kai-koma-ga-dake (甲斐駒ヶ岳) is its sidekick subpeak, a large granite outcropping just below it & to the southeast known as Marishiten (摩利支天, from “Marici” in Sanskrit), named after a 3-headed, 6-armed female warrior goddess with a different weapon in each hand & riding on the back of a boar. Check out the picture of the very impressive Marishiten (摩利支天) monument there in my photo album below. The trek back down to the Kitazawa-toge (北沢峠) trailhead was fairly uneventful, albeit SO beautiful, passing Mt. Komatsumine (駒津峰) once again as well as Mt. Futagoyama (双 児山). I caught the 13:10 microbus back to Hirogawara and shared a taxi back to JR Kofu Station. Catching an express train there around 3:30 pm allowed me to arrive back at JR Shinjuku Station in Tokyo by 6:30 pm. The pics in the collage below are a sampling of my Senjo/Kai-koma photo album hosted at Flickr. Clicking on the collage will open up the album on a separate page. I hope you enjoy them ! Click here to view all of my Mt. Senjo-ga-take (仙丈ヶ岳) and Mt. 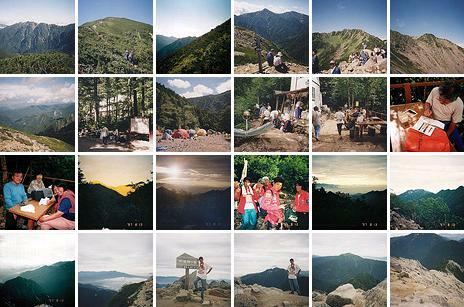 Kai-koma-ga-dake (甲斐駒ヶ岳) pics, taken Aug. 12-13, 1997.
except that I climbed Mt. Senjo-ga-take (仙丈ヶ岳) first. One of the best ways to get to JR Kofu Station (甲府駅) is to take the Super Azusa limited express train from Shinjuku Station (新宿駅), which only takes about 1.5-2 hours. The westbound JR express train Shinjuku to Kofu timetables are here (timetables for eastbound JR express trains back to Shinjuku are here). Also, there are obviously slower and cheaper ways to get there on JR's Chuo Line. More info in English is available from JR East at (050) 2016–1603, 10:00 to 18:00, every day of the year except during the year-end/new year holidays. Private cars are restricted on the road to Hirogawara, but 515 spaces are available near Ryuo (竜王) Station (¥800/day) & 650 free spaces are available at the Ashiyasu municipal parking area (市営芦安駐車場) along the bus route from Kofu Station, and 377 free spaces are available at the Narada (奈良田) parking area near the Narada onsen trailhead for Mt. Notori-dake. If you have any extra time to kill after your hike and don't need to rush back home, I highly recommend that you soothe your muscles in a nice hot spring rotemburo in the Yumura Spa area, a 10-minute bus ride from JR Kofu Station. And it'll only dent your pocketbook by ¥700 or so. Kofu is a very historic city, known as the home of Takeda Shingen, one of Japan's most powerful 16th-century warlords. And because about 30% of Japan’s carved jewelry is produced in the area, Kofu is known as Japan's most famous jewelry city. Kofu is also home to Hidetoshi Nakata, the world-famous soccer player who last played in the Premier League and retired following the 2006 World Cup, and Naoko Takeuchi, creator of "Sailor Moon" and other comics. So if you have a few extra hours to kill in Kofu, besides the abundant hot springs, there are a number of fun things to see and do there, including the Shosen Gorge, Takeda-jinja Shrine (dedicated to the famous warlord), and the Yamanashi Prefectural Museum of Art. My Aug. 12-13, 1997 climb of Mt. Senjo-ga-take (仙丈ヶ岳) and Mt. Kai-koma-ga-dake (甲斐駒ヶ岳) in the Southern Japan Alps (南アルプス) was an awesome hiking trip. From these hiking trails, the views of the other several nearby peaks are arguably some of the most spectacular you'll ever see anywhere in Japan. The only drawback about hiking during the busy Obon holidays in Japan, though, is you are certain to encounter crowded conditions on the trails & in the huts. But I guess that comes with the territory, since Hirogawara (広河原) is not only the main access route to Mt. 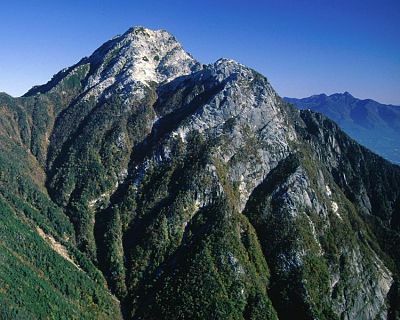 Kita-dake (北岳), Japan’s 2nd highest peak, but also the most popular base for climbing the magnificent Southern Japan Alps (南アルプス). I hope you found this page informative & do please stop by again soon, as I intend to update it with more details in the future on climbing Mt. Senjo-ga-take (仙丈ヶ岳) and the Mt. Kai-koma-ga-dake (甲斐駒ヶ岳), including a record of my climbing schedule and trip expenses. In the meantime, if you have any quick questions for me, feel free to give me a shout by posting them in the "Add your comment" section below or by clicking on the "Contact Me" link at the top right of this page. Or if you'd care to share your climbing story & pics with other climbers, feel free to do so in the "Have a Question or Story...?" section below. And if you are lucky enough to hike up either of these awesome peaks, I wish you my most heartfelt good luck. GO FOR IT!! Have a Question or Story about Climbing Mt. Senjo-ga-take or Mt. Kai-koma-ga-dake? Do you have a question or story about climbing Mt. Senjo-ga-take or Mt. Kai-koma-ga-dake? Be among the first to pay it forward and share your climbing experience (along with up to 4 pics) with other visitors to this page still planning their climb! Unlike social media sites like Facebook & Twitter where your post quickly gets pushed down off the page, your story will be given a dedicated webpage and its own URL, giving others a chance to comment (you can see similar stories submitted so far on Climbing Mt. Fuji). And feel free to link your story back to your webpage, blog, or any other page of your choosing. Maximum file size is 1 mb. If you have any trouble, please notify me by using the "Contact Me" form, and I'll give you my email address so you can email your photo. Then I'll upload it for you.